Officially the electro wizard has been out for quite a while due to the electro wizard challenge, but now the electro wizard is released throughout Clash Royale in all chests! This means you need the best electro wizard decks and you need to learn some great electro wizard strategy to win with those decks. One of the most important aspects of the electro wizard is that when you deploy the electro wizard, he will do damage, along with stunning all cards within the radius. This damage is enough to take out skeletons and spear goblins while severely damaging goblins and minions. Used in conjunction with the ice golem, the electro wizard will be able to take out a minion horde without even firing a shot. 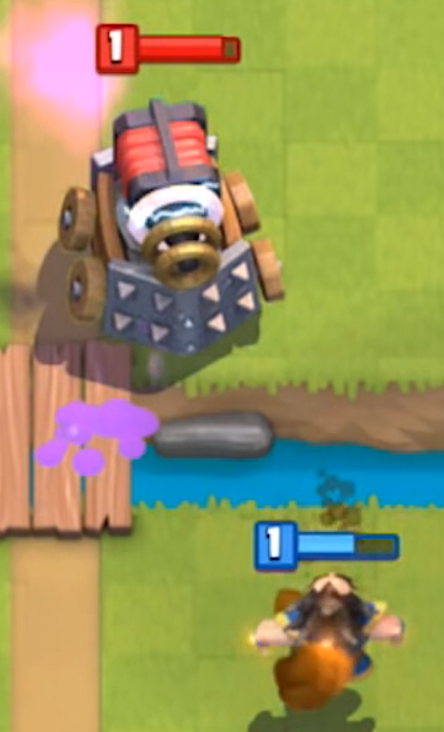 Another great move for the electro wizard would be to drop it right below a low health lava hound. This would kill the hound and damage the pups, making it nearly impossible for the pups to do much damage. When the electro wizard spawns, he also stuns along with doing the death damage. So the spawn of an electro wizard is like using a zap, plus you get a unit that can do more damage. Not bad for 4 elixir! While the electro wizard is a strong card, its biggest weakness is definitely its HP. 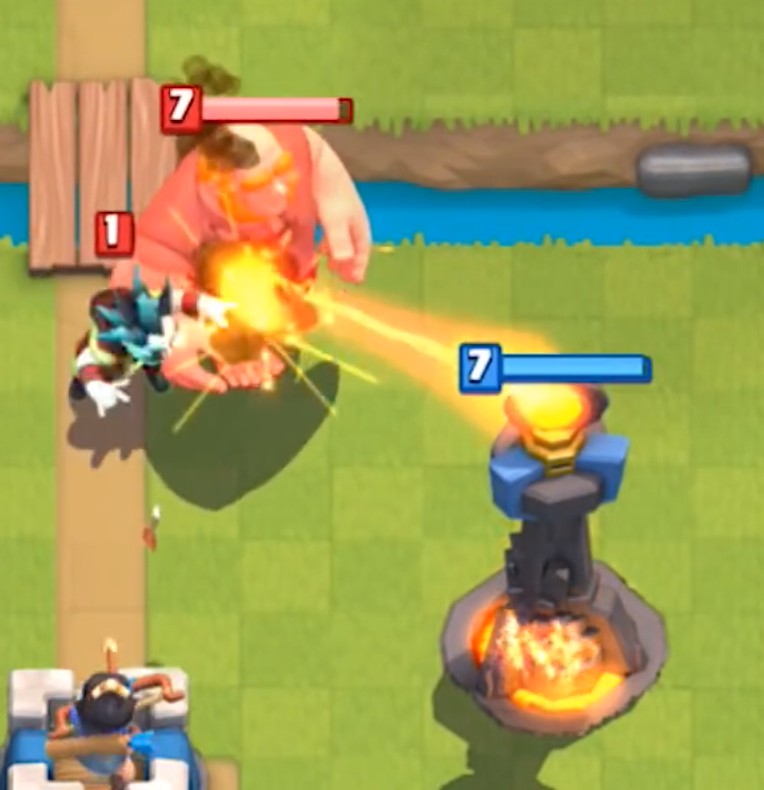 At tournament level, the level 1 electro wizard can be taken out by a level 7 fireball. If we keep going, a level 2 EW can be taken out by a level 8 fireball; level 3 by a level 9 and so on. 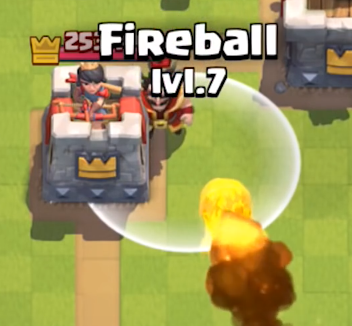 C4D Tip: Try baiting out the fireball with barbarians or another card that is usually fireballed. Of course, another viable counter to the electro wizard is the lightning spell, just make sure you get another unit and the arena tower with that spell! You can also use a lot of different troops to counter the electro wizard, but fireball is by far the most reliable since the electro wizard’s stun can make it so that your counter troops aren’t able to completely take it out. The electro wizard on defense is one of the best uses for the card throughout Clash Royale. Since he zaps 2 units at a time, he is able to slow down big pushes, as well as damage the troops through his small damage attack. 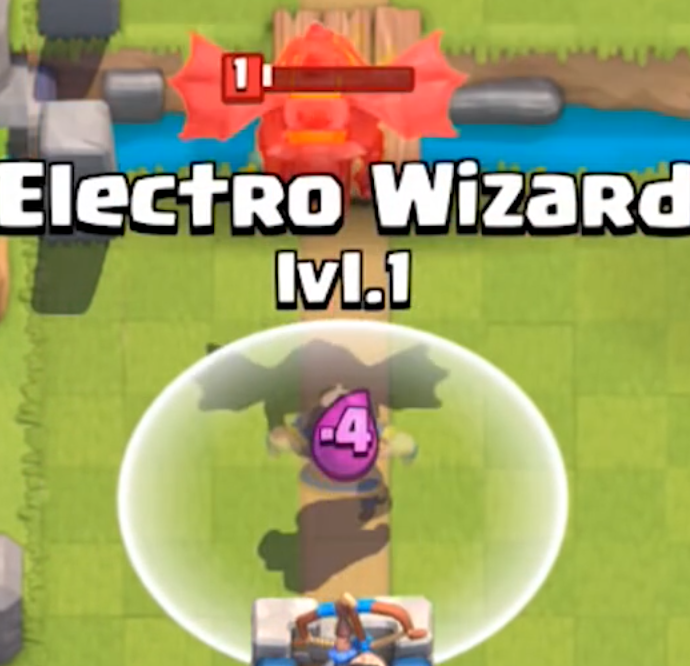 One of the cards the electro wizard is the best at defending is sparky, since the EW’s zapping ability makes it so that sparky can never fire! 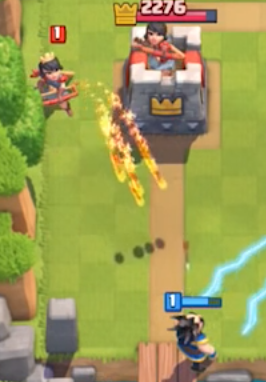 Along with sparky, the electro wizard can also take out the inferno dragon, since the EW resets the charge, never allowing the inferno dragon to get up to full firepower. Having the electro wizard on offense is definitely one of the best moves in the game. 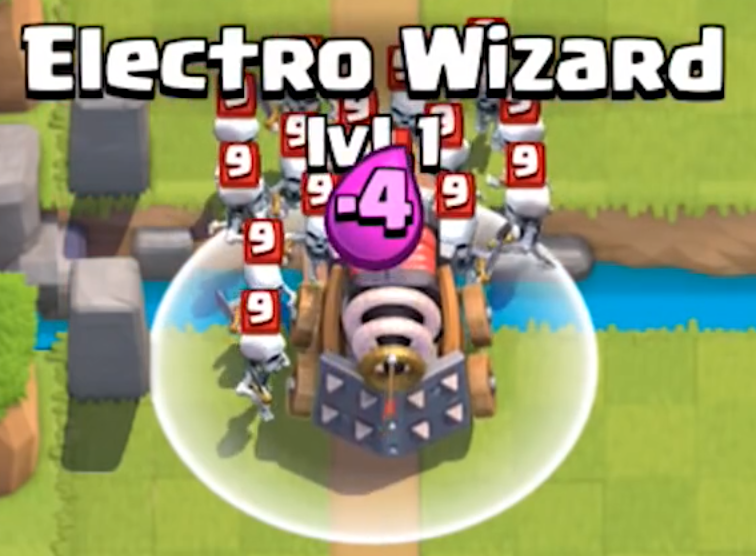 You always will want to have the electro wizard behind a tank, due to its low health. C4D Tip: Don’t play the electro wizard with cards like the wizard or musketeer, since a fireball could end your entire push. 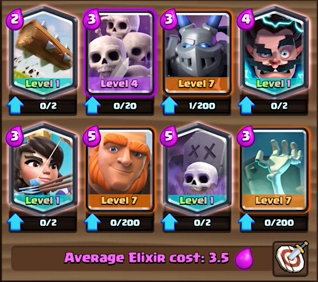 The reason why the electro wizard is so powerful on offense is because he can reset the very popular inferno tower. 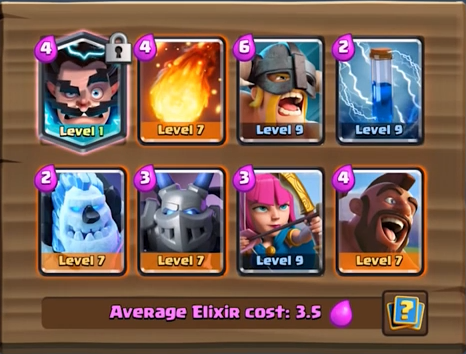 A giant-electro wizard push will bust through an inferno tower like CHEESE and do some serious damage on the arena tower. Honestly, the electro wizard is such a versatile card that he can be used in almost any deck, with almost any push. Just make sure that the electro wizard isn’t in a push by himself. 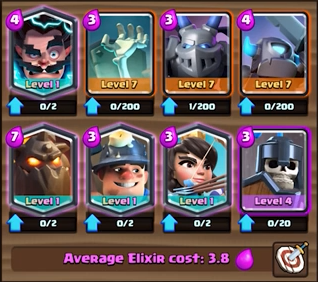 Ice golem, miner, giant, hog, royal giant, or golem are all great combined with the electro wizard. To sum it all up, the electro wizard is a great support card and should be a strong card within Clash Royale. I hope you guys enjoyed this article all about explaining the electro wizard and the great electro wizard decks! Thanks a ton for reading, and make sure to stop by soon for more Clash Royale content! Pingback: Electro Wizard Decks + How to Use the Electro Wizard | Clash of Clans Guide, Strategies, Tricks and More! So far electro wizard is not yet a problem in most deck. It is very hard to use but I like the damage of it. Yeah I think it is a fun card! I made a really weird deck, and it wins about a quarter of the battles up here in royal arena as a level 8. Not good enough to stay here, but really fun if you have another deck that can keep you afloat in royal. Right now I am using a spawner deck for that purpose, because I just want to have fun making people rage quit. The deck is: Inferno tower, mirror, lightning, fireball, zap, goblin barrel, poison, arrows. I think at higher levels, the poison or some other card may be replaced by the graveyard spell. This is an all spells plus inferno tower deck, really fun if you can use it. I am using it to practice using spells in battles, since I am not the best at getting the perfect hits. Super interesting… I love goblin barrel mirror! I dare you to try it out on your channel! I wonder how good that deck can be. The main thing is to not hit the king tower, so goblin barrel can do more work. Mirror inferno and lightning are both good defenses, and fireball can also be used against witch, musketeer, etc. Just watched it, very nice!